PLEASE NOTE: Alec is currently moving from Vermont to California. He will not be able to ship out any new orders until Monday June 11th. Thank you for your patience and sorry for the delay! 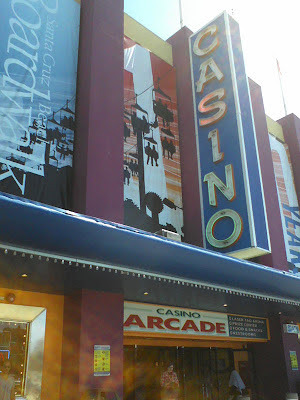 Pinball in the Wild: Part 2 - Santa Cruz Boardwalk! Last week Claire and I went out to the Bay Area to find an apartment. It took us about three days total to track down a place which was great, because we had left ourselves a whole week to accomplish this task. With a signed lease in hand, we had a few days to just have fun in the bay area before we had to head back to Vermont for the rest of our moving madness. For me, this meant playing as much pinball as possible. 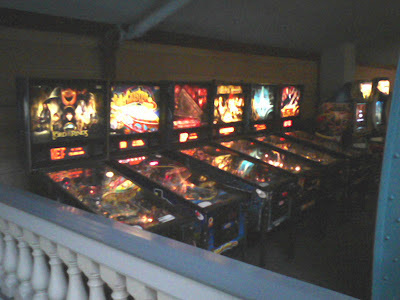 For starters I hit up the Bay Area section of PinballMap.com 456 machines at 217 locations? Yes please! The closest pinball I could find to where we were staying was at the Heart and Dagger Saloon. They had a Medieval Madness, Theatre of Magic and Simpsons Pinball Party. I was able to get replays on all three. They played decently, except for a few weak flippers and not one of the games was level (all tilted to the left, which was frustrating). Also, there was a CFF high score on Medieval. Out-of-state intimidation! The next day our hosts Kettner and Lacy drove us down to the Santa Cruz boardwalk, where I was told there would be plenty of pinball. 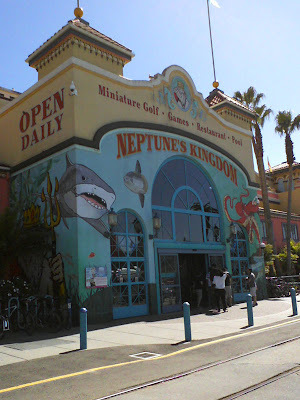 Our first stop was into Neptune's Kingdom which had an arcade on the ground floor. From left to right that's Lord of the Rings, Roller Coaster Tycoon, Terminator 3, Pirates of the Carribean, Tron Legacy, AC-DC (brand new but somehow missing the rubber on the right flipper!?!) and then after those stupid shooting games there was also a Stern Spider-man and Batman. The upper floor is mostly pool tables, so this was a nice quiet place to play. 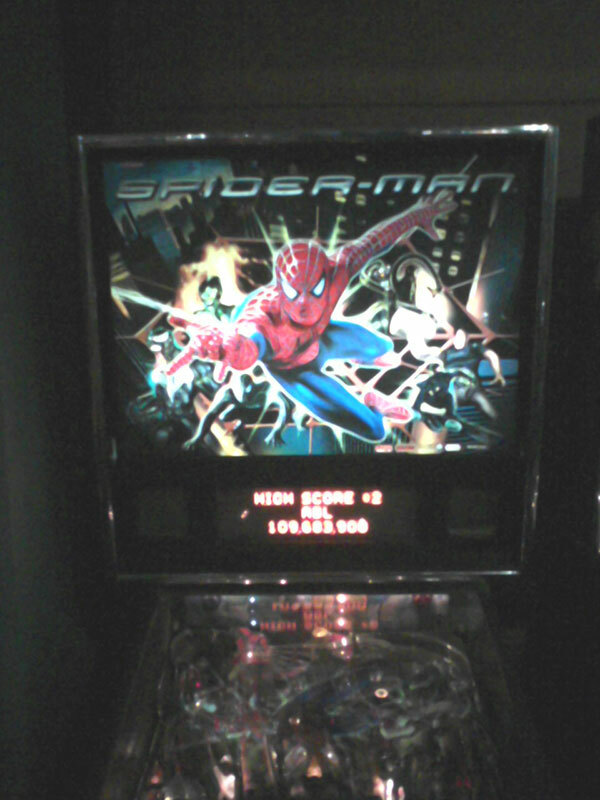 Some foolish pinballer had also loaded up four player games on Spiderman and Batman, so Kettner and I got to play a lot, for free. This Tron also had the crazy neon lights along the ramp shot (LE?) which I had never seen before. The AC-DC didn't have the dropped playfield, and it was too heartbreaking playing it without the flipper rubber. Next time! Next we went off and rode the Giant Dipper. I've found that as I get older, I have less of a stomach for roller coasters, so afterwards I just took it easy... and played some more pinball! A little farther down the boardwalk was the Casino Arcade. From left to right that's Ripley's Believe It or Not, Stern's Indiana Jones, Simpson's Pinball Party, Wheel of Fortune, Attack From Mars and Addams Family (switched off). Indy was super broken and after watching three people dump their money in and get robbed, I switched it off (is that the right thing to do in this scenario?) Claire and I both got replays on Attack From Mars and we played some Wheel of Fortune, which was crazy. I got two replays on Simpsons thanks to my warm-up the day before. I really wanted to play Ripley's but it was so crazy in the arcade, I never got a chance. There were all these kids running around and it was so loud, we decided to head back to Neptune's Kingdom. I'm glad I did! I ended up having my best game ever on Spider-man with 109 million, which scored me a number two spot on the high score board! I gotta say, this is the ideal scenario when playing pinball in the wild. You scope out the scene, see which machines are in good shape. Then get warmed up and hopefully score a couple of replays (it's so much more of a thrill to get a "KNOCK" in a crowd, instead of at home by yourself) and then before you take off, you leave your initials in one of the machines. NEXT UP: The Pacific Pinball Museum! No trip to the Bay Area would be complete without a visit to this fine establishment. And wait until you hear who I ran into whilst there! I recently spent a week in the Bay Area, where I played a lot of pinball. I have a couple of posts lined up about my adventures, but before I dive into them, I feel like I should back up... all the way to New York City! 1) Fratelli's Pizza Joint is CLOSED. This was really heart breaking! 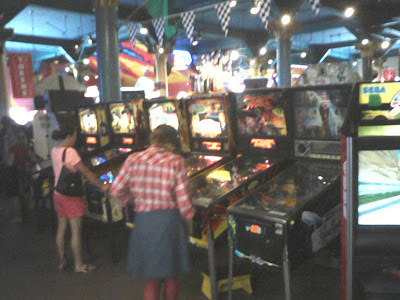 I only got to play there a few times last year but all the machines worked well and there were a lot of them! Williamsburg still has the Satellite Lounge and a couple of other machines scattered about, but this place was the best of them. It will be missed! 2) Reciprocal Skateboards and Pinball has EXPANDED! They rented out the place next door, so now one half is skateboards (as you walk in) and the other half is all pinball, all the time. Jon has about ten machines in there, and they all work great. The best part of that whole trip to New York was after the show on Saturday, when I took Claire and my friends to Reciprocal to play pinball, only to find that Jon Chad had taken all of his friends there to play pinball. I shouted "Well look who it is!" and then many multi-player games were started. Good times! Okay, my next post will jump back to the West Coast for a review of the Santa Cruz boardwalk! Thanks to everyone who ordered a copy of the brand new Drop Target #4. I have been busy this weekend filling orders, which are now zipping their way all over the country, thanks to the United States Postal Service. 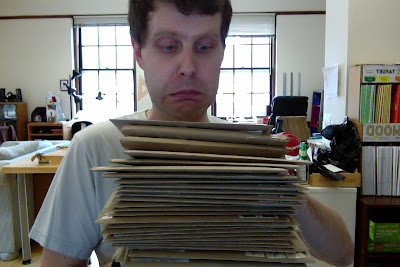 It was also exciting to see some international orders from France, Belgium, Norway, and the U.K.
Keep your eyes on those mailboxes - there are zines on the way! 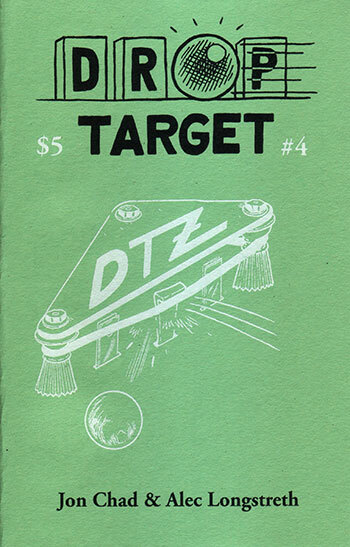 Drop Target Zine #4 is now available for ordering! Drop Target Zine #4 is finally available for ordering! - FOR WHOM THE COINS TOLL by Jon Chad! - THE GAME OF A LIFETIME by Alec Longstreth! PLEASE BE FOREWARNED: This is an extremely busy week for Jon and me here at CCS! The senior thesis evaluations are all day Thursday and graduation is on Saturday. 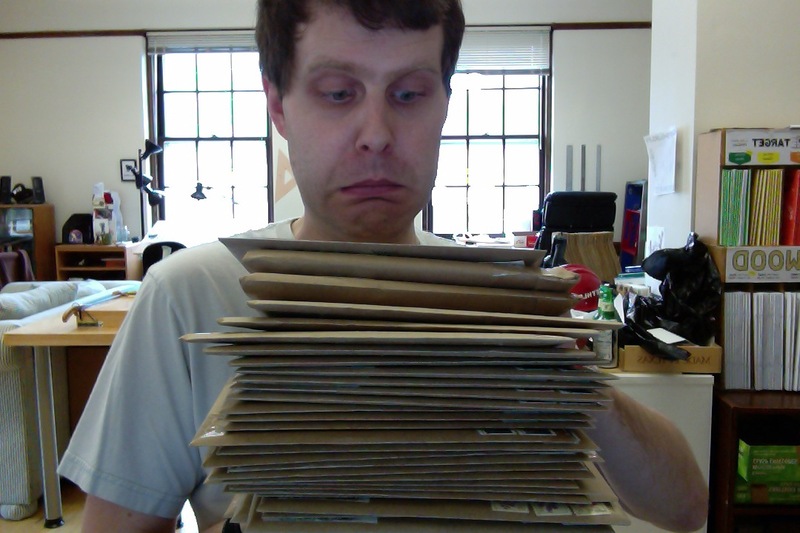 We might not be able to get the first wave of orders in the mail until Monday, but we'll do our best! Thank you in advance for your patience.